Welcome to the Proof Fitness Teachers appreciation page. We would like to extend a our deepest gratitude to all Teachers and Faculty for not only building the foundation for our children but also being an inspiration to consistently help others. We never have to guess when a teacher walks into our facility because there is a genuine demeanor that easily identifies each one. 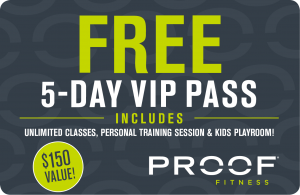 As part of our appreciation, Proof Fitness is extending a 5 Day ALL ACCESS VIP PASS for Teachers and Faculty members that includes Unlimited Classes and Free Childcare. To register for your pass, simply complete the online form and activate your pass prior to May 18. Enjoy a great workout and thank you for everything you do! !